Not content with wreaking havoc on the Middle East, ISIS is bringing its terrorism to the West in general, the U.S. specifically and the U.S. military especially. Officials have detected 33 ISIS-related plots against Western targets this year, 26 of them against the U.S., and 19 of those against U.S. military targets. 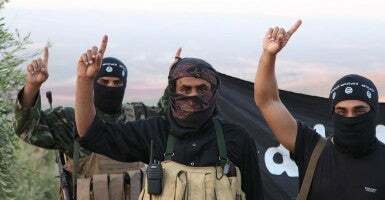 It also has stepped up recruiting and the inspiration of lone wolf terrorists through the more than 200,000 tweets and other communications it sends each day via social media. McCaul, chairman of the House Committee on Homeland Security, said ISIS, through its social media, recruiting in the West and terror operations elsewhere, has become a “global menace” that has caused jihadist attacks on American targets to triple in the last five years. David Inserra, a policy analyst in homeland security and cyber security at Heritage, said recent attacks have differed from those in the past. Most prior attacks, he said, were done by individuals inspired or directed by al-Qaeda, its affiliates or some other ideology. But all the plots this year, he said, have been directed or inspired by ISIS, and U.S. service personnel and facilities have emerged as its top targets, he said. To combat ISIS and other terror threats, Edwin Meese, former U.S. attorney general under President Reagan, said the U.S. is fortunate to have the FBI, which has adapted to changes since 9/11 and can continue to adapt in the future to prevent terror plots from being executed. “The future of the FBI will be the way in which this country is protected against terrorism,” Meese said. Additionally, McCaul said, building a strong military and establishing a multinational coalition, overseen by the U.S., is necessary to eliminate terrorism.